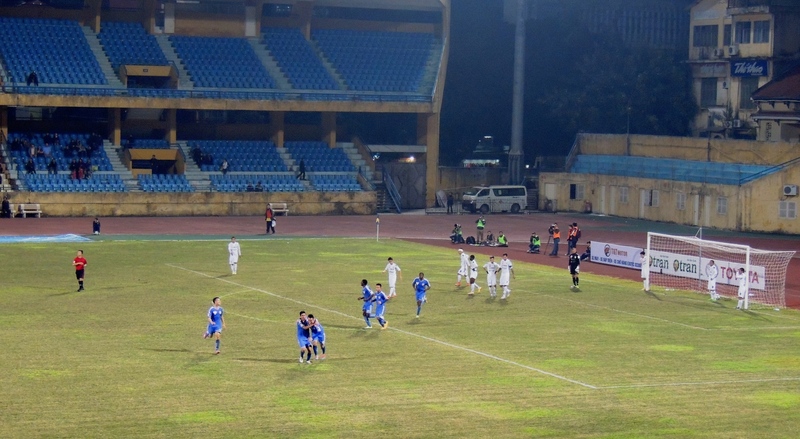 Ha Noi T&T’s title ambitions dented after falling to defeat at Thanh Hoa. 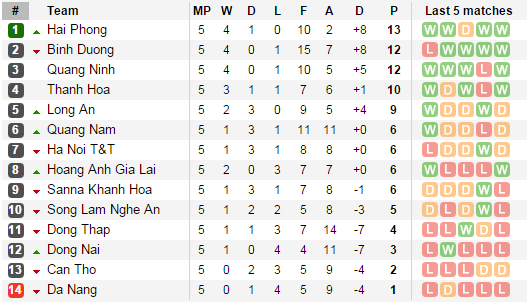 Ha Noi T&T ambitions of claiming a 3rd V League title have been severely dented over the past 9 days. The team from the capital, and for many people the only likely challenger to Binh Duong, have taken just 2 points from a possible 9. Ha Noi T&T 4 v 4 Quang Nam. T&T surrendered a 4-1 lead at the Hang Day as Quang Nam mounted an incredible comeback , scoring three times in the last 10 minutes. 2014 V league top scorer, Samson, bagged an impressive hat-trick while Gonzalo, capped his first start of the campaign with a goal. After a dominant first half performance from T&T, Henry Kiseeka scored what seemed to be nothing more than a consolation as the teams went in 2-1 at half- time. With just ten minutes of the game remaining Hanoi were cruising to a second victory of the season, leading 4 v 1. A comfortable performance and one reminiscent of the title winning team of 2013. The team from central Vietnam hadn’t given up hope though. Striker, Patiyo, pulled a goal back, and three minutes later had his second . Hanoi T&T had collapsed. Vũ Anh Tuấn smashed home the equalizer on 87’. 3 goals in 7 minutes had sealed an incredible point. The likelihood of Thanh Hào featuring in the centre of defence again for T&T after making his debut must be slim. But in all fairness, the whole defensive display of the home side was dismal for those ten minutes. Indeed Thanh Hao was dropped and Cyrus returned to the Hanoi defence, which subsequently meant Hector was also dropped due to the limit of two foreigners per team (Samson has VN citizenship). Hanoi fell behind to a goal by Ngô Quang Huy before Nguyễn Văn Quyết got his first of the season to equalize for T&T. Another point for Hanoi. Or, depending on expectations, two lost, against a team who had lost their opening three games of the season. Binh Duong secured their fourth straight win, beating SLNA 1-0. Hanoi T&T traveled south to Thanh Hoa on Sunday, a game I’d miss due to Lunar New Year celebrations at my company. T&T’s performance, even in defeat, was better than most of the performances I had to endure. T&T looked solid, Cyrus maintained his place in defence alongside Van Bien. Samson was missing, so Gonzalo led the attack, supported by Thnah Luong and Van Quyet. Thanh Hoa featured ex-Hanoi holding midfielder Sy Cuong, a transfer that worried me at the start of the season, and still does. 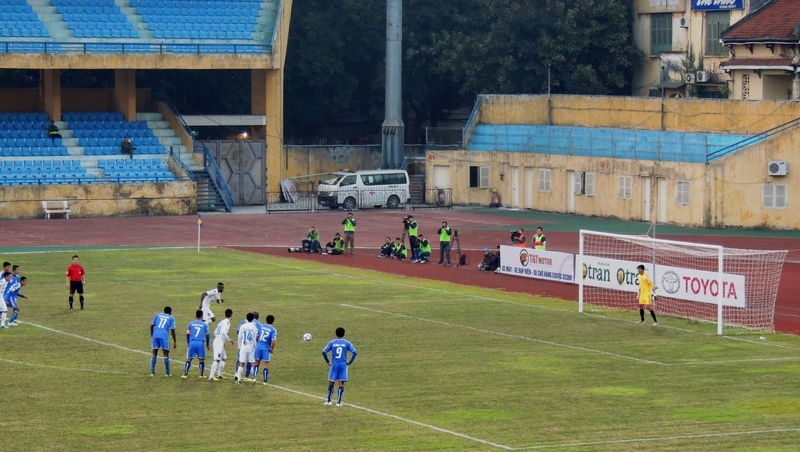 After a goalless first half Nguyen Ngoc Duy opened the scoring for T&T with half-volley from inside the area. T&T, again, could not hold on to lead and eventually fell to their first defeat of the season as Lê Quốc Phương and Le Van Tan secured the 3 points for Thanh Hoa. After back-to-back away fixtures Hanoi T&T return to the capital to host Dong Nai, this coming Saturday.